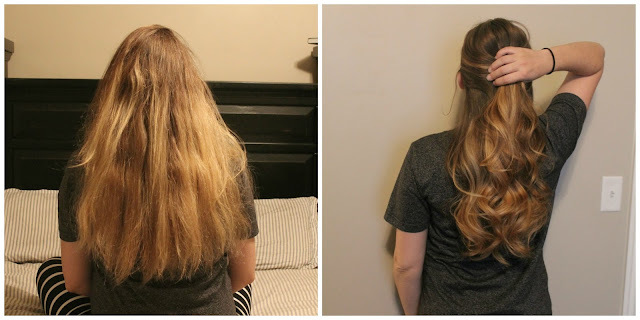 No Heat Curls + A Giveaway! My before hair. Make sure you are using freshly washed hair. Then apply a little bit of mousse throughout your hair and make sure it is completely dry before starting your savvy curler. Wrap your hair in 1 inch sections, pulling in more hair every time. Make sure your hair is divided half in half so you wrap your hair away from your face. This is what your hair will look like once it is completely wrapped. I slept in mine to make sure my curls were tighter. And it was super comfortable! If you want loose curls, make sure to leave in for 3-4 hours. This is great for when you're chasing kids around the house all morning ;) I'm trying to prepare myself for the twins! Haha! I got ready this morning and kept the savvy curler in my hair. These are my results when I pulled my hair out! It's perfect for when you don't have time to sit there with a curling iron. It typically takes me about 30 minutes to curl my hair when I have fresh hair. I don't know if I'll have that kind of time while I'm adjusting to having newborn twins to take care of. When I can just put in the savvy curler at night and have nicely curled hair in the morning, it's going to make me feel more put together. I am very picky about how my hair is curled, and I LOVE how the savvy curler curled it! Savvy Curls is running a black Friday deal today! You can get 20% off your purchase with the code black at checkout HERE. You can also win a Savvy Curls band below! Such a neat concept! I have thick hair and this would save so much time!